Breakout Players – 2018-19: Nolan Patrick - The Point Data-driven hockey storytelling that gets right to the point. 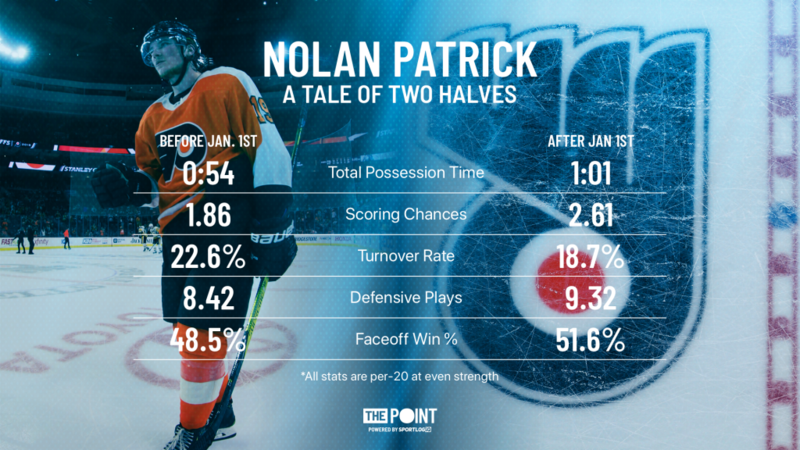 Nolan Patrick’s rookie season was a tale of two halves. He struggled at first, with only 7 points in his first 29 games, missing 9 contests to injury. However, he turned a corner after January 1st, scoring 7 points on the powerplay alone and 23 points overall while playing in all 44 of his team’s games. Now with a full year of experience in the NHL, Patrick could take massive strides next season. So, what changed for Patrick during that second half? Honestly, pretty much everything. Patrick saw an increase of roughly 3 minutes in ice time per game and he answered in a big way. He saw his puck handling responsibilities increase while also managing to cut down on turnovers significantly. Overall, he was a more dangerous offensive threat, both with his shooting and passing, while also being more active on the defensive end. He even improved his faceoff % to over 50%. To put it simply, he was just better in every facet of his game. The other big change for Patrick was his role on the powerplay. To start the season, he was one of the primary puck handlers on the right wall for the 2nd unit. That wasn’t a very successful role for him, with only one PP assist to show for it. Over the second half, he was moved to the top unit, taking over Wayne Simmonds’ role of net-front presence, and he thrived. His inner slot shots per 20 skyrocketed, going from 0.37 to over 2, an increase of over 500%. This new role led to five goals in a little over a month on the man advantage, all coming from the inner slot. The acquisition of James van Riemsdyk makes Patrick’s role on the man advantage a bit unclear. JVR is among the elite net-front presence in the league and is likely to receive most of the minutes on the first unit in that role. His arrival, however, isn’t all negative for the sophomore. 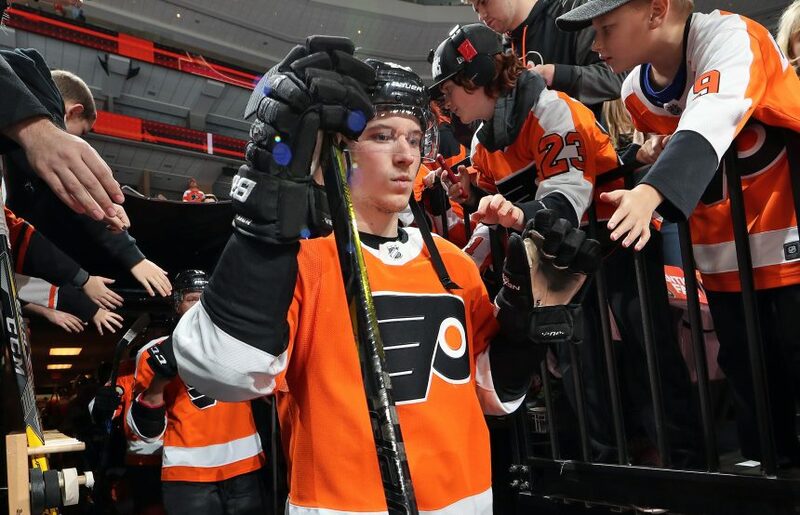 The two are likely to team up on Philly’s 2nd line with Jakub Voracek, which would be a massive upgrade over Oskar Lindblom, the left winger who played the most with Patrick and Voracek during the 2nd half. Patrick could still get playing time on the 2nd powerplay unit, where hopefully they use him in front of the net and not on the right wall. With improvements this significant over the course of his rookie year, it’s exciting to think what he will be able to do with a year of experience and a surgery-free offseason, a luxury he hasn’t had in a couple of years. Add to that the improved quality of his teammates and the 2nd overall pick from 2017 seems poised to put up big numbers next season for the Flyers.